Product #21551 | SKU B3W4FF05BSL | 0.0 (no ratings yet) Thanks for your rating! 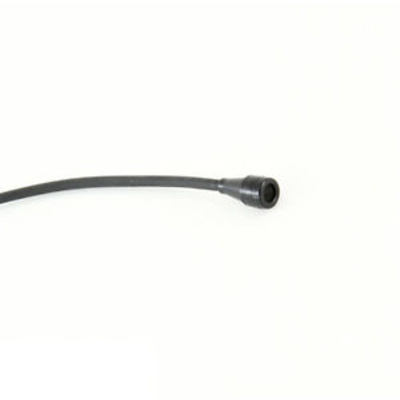 The black B3 Omnidirectional Lavalier Mic, Standard Sens, with TA4F Connector for Shure Wireless Transmitters from Countryman is a water-resistant, miniature lavalier microphone for capturing high-quality audio. It can be used in a variety of applications such as a tie-clip lavalier in interviews, a hair-hidden mic for drama, a water-resistant mic for water sports and hurricane reporting, or simply a small mic to hide in a prop flower vase. The capsule is resistant to moisture, which allows for placement in the hair or on bare skin, and its omnidirectional polar pattern minimises handling noise, wind noise, and plosives (popping). Furthermore, a variety of skin-matching colours are available. The B3's cable terminates to a TA4F connector for direct connection to a Shure AXT100+, BLX1, FP1, GLXD1, PG1, PGX1, PGXD1, QLXD1, SLX1, UC1, ULX1, ULXD1, UR1, or UR1M wireless bodypack transmitter. Additionally, a carrying case, two cable clips, a windscreen, and three protective caps are also included. Looks great when you want to see it, virtually disappears when you don't. The B3 is easily hidden in hair or on costumes, with five colours to match clothing, hair, and skin tones. Use a felt tip marker to colour the white caps for near-perfect concealability. Never suffer the hassle and degraded sound quality of under-clothing miking again.